Rosen takes a large dose of Shakespeare (As You Like it, specifically); adds a liberal dose of mad science and a pinch of Ada Lovelace; shakes gently, and decants the resulting mixture in fairly smooth prose to produce a generally enjoyable book, with a somewhat abrupt and disappointing finish. The first thing to know about me and this book is that with one exception (Much Ado About Nothing, thank you Kenneth and Emma), I basically loathe Shakespeare’s comedies. I do not like twins. I do not like mistaken identity. I do not care. I will not go and watch a comedy if I have a choice do not even try. Rosen, however, made me care, because finally there is a good reason for identity swapping rather than just the amusement of seeing a man in a skirt pretending to be a man (oh HA HA geroffthastage). But taking your brother’s identity in order to get into the most prestigious science academy in London in order to make crazy beautiful science with the full intention of revealing yourself as a lady at the end of your first year? VIOLET I LOVE YOU. The fact that your brother is gay and you don’t have a problem with that is just extra cute and an additional bit of sticking it to the establishment. I liked it. 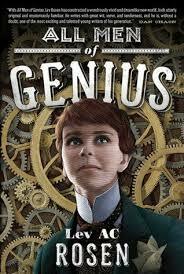 If you like slightly artificial prose (not as jaunty as Gail Carriger but that sort of thing) and some seriously mad science, this is a fun book. There are lots of gears. And talking rabbits. No really, it’s funny, if lacking in ethics. Also invisible cats, difficult decisions, and cranky professors. Thoughts for people who’ve read the book: SPOILERS AHOY! I really enjoyed Violet’s interactions with the other students, overall; it’s a slightly grown-up version of boarding school romps, basically (like, the drinking is legal). I was really pleased that Rosen allowed Jack and Violet to be and remain good friends – I guess it helped that Jack had his sights firmly fixed on Cecily – and that it turns out Drew knew she was female for a while and it just didn’t matter. Hooray for cross-gender friendships! I generally liked Cecily. I liked that she was good at science, and wanted to be good at science. I was bemused by her attachment to the rabbit, since it made this intelligent young woman seem like she was about six. I also generally liked Miriam, and I was fascinated by her status as a dark-skinned, widowed, Jew… but it did feel a bit tokenistic. That is, I am perfectly fine with her being all of those things, but Rosen begins to explore the ramifications of those aspects of her identity aaaaaand doesn’t fulfil the promise. The relationship between Violet and the duke is a bit ugh. The age difference is icky. The ‘but I don’t think I’m an invert!’ (Rosen’s word, presumably – I hope! – historically appropriate) attitude from the duke after kissing Violet-as-Ashton skirted, and may have fallen into, problematic (I’m cis, I’m no judge). The switching of voices. What for, Rosen? The fact that it doesn’t properly start until well into the book makes it particularly weird. I liked Fiona well enough but I really didn’t need her perspective, nor that of the duke, nor Cecily or Miriam’s, unless they were all going to be as thoroughly explored as Violet’s. Which they’re not. And Ashton is distinctly left out, really, which makes no sense. The ending. The marriage happens waaay too fast – or it could have happened in as few pages but there needed to be a bit more about how it all got resolved, and wait a minute isn’t she a bit young? ?